The report introduces and describes the technology of “Dual Clutch Transmission”, which is a relatively new technology. It has the advantage of both automatic and manual gears. It helps the driver to control the clutch without a clutch pedal, hence giving him a smoother driving. The technology has been used by various car manufactures and is gaining a large market. A dual-clutch transmission offers the function of two manual gearboxes in one. When a driver wants to change from one gear to another in a standard stick-shift car, he first presses down the clutch pedal. This operates a single clutch, which disconnects the engine from the gearbox and interrupts power flow to the transmission. Then the driver uses the stick shift to select a new gear, a process that involves moving a toothed collar from one gear wheel to another gear wheel of a different size. Devices called synchronizers match the gears before they are engaged to prevent grinding. Once the new gear is engaged, the driver releases the clutch pedal, which re-connects the engine to the gearbox and transmits power to the wheels. If the teeth, the so-called dog teeth, make contact with the gear, but the two parts are spinning at different speeds, the teeth will fail to engage and a loud grinding sound will be heard as they clatter together. 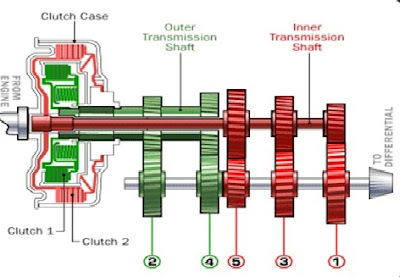 For this reason, a modern dog clutch in an automobile has a synchronizer mechanism or synchromesh, which consists of a cone clutch and blocking ring. Before the teeth can engage, the cone clutch engages first which brings the selector and gear to the same speed using friction. Moreover, until synchronization occurs, the teeth are prevented from making contact, because further motion of the selector is prevented by a blocker (or baulk) ring. When synchronization occurs, friction on the blocker ring is relieved and it twists slightly, bringing into alignment certain grooves and notches that allow further passage of the selector which brings the teeth together. Of course, the exact design of the synchronizer varies from manufacturer to manufacturer. The IBM is now developing a virtual brain known as the Blue brain. It would be the world’s first virtual brain. Within 30 years, we will be able to scan ourselves into the computers. Why We Need Virtual Brain? Today we are developed because of our intelligence. Intelligence is the inborn quality that can not be created .Some people have this quality ,so that they can think up to such an extent where other can not reach .Human society is always need of such intelligence and such an intelligent brain to have with. But the intelligence is lost along with the body after the death. The virtual brain is a solution to it. The brain and intelligence will alive even after the death. IBM, in partnership with scientists at Switzerland's Ecole Polytechnique Federale de Lausanne's (EPFL) Brain and Mind Institute will begin simulating the brain's biological systems and output the data as a working 3-dimensional model that will recreate the high-speed electro-chemical interactions that take place within the brain's interior. These include cognitive functions such as language, learning, perception and memory in addition to brain malfunction such as psychiatric disorders like depression and autism. From there, the modeling will expand to other regions of the brain and, if successful, shed light on the relationships between genetic, molecular and cognitive functions of the brain. The World Wide Web can be considered as a large distributed information system that provides access to shared data objects. As one of the most popular applications currently running on the Internet, The World Wide Web is of an exponential growth in size, which results in network congestion and server overloading. Web caching has been recognized as one of the effective schemes to alleviate the service bottleneck and reduce the network traffic, thereby minimize the user access latency. Proxy servers are generally used to allow access to the Internet from users within a firewall. For security reasons, companies run a special type of HTTP servers called "proxy" on their firewall machines. A Proxy server typically processes requests from within a firewall by forwarding them to the remote servers, intercepting the responses, and sending the replies back to the clients. Since the same proxy servers are typically shared by all clients inside of the firewall, naturally this leads to the question of the effectiveness of using these proxies to cache documents. Clients within the same firewall usually belong to the same organization and likely share common interests. They would probably access the same set of documents and each client tends to browse back and forth within a short period of time. Therefore on the proxy server a previously requested and cached document would likely result in future hits. Web caching at proxy server can not only save network bandwidth but also lower access latency for the clients. Greedy Dual Size (GD-Size): It associates a cost with each object and evicts objects with least cost/size. This is a generalization of the LRU algorithm to the case where each object has a different fetch cost. The motivation behind the GD-Size scheme is that objects with large fetch costs should stay in the cache for longer time. The algorithm maintains a value for each object that is currently stored in the cache. When an object is fetched into the cache, its value is set to its fetch cost. When a cache miss occurs, the object with the minimum value is evicted from the cache, and the values of all other objects in the cache are reduced by this minimum value. And if an object in the cache is accessed, then its value is restored to its fetch cost. A further implementation optimization is to note that it is only the relative value that matters in this algorithm. So, instead of deleting a fixed quantity from the value of each cached entry, the fixed quantity could be added to the value of the new object, and the effect would remain the same. Hierarchical Greedy Dual (Hierarchical GD): This algorithm does object placement and replacement cooperatively in a hierarchy. Cooperative placement helps to utilize a nearby idle cache and the hit rates in the cache hierarchy are increased by placement of unique objects. It is the same as GD-size with the added advantage of cooperative caching. In this scheme, when an object is evicted from one of the child clusters, it is sent to its parent cluster. The parent first checks whether it has another copy of the object among its caches. If not, it picks the minimum valued object among all its cached objects. Out of the two objects, it retains the one that was used more recently. It propagates the other object recursively to its parent. Prefetching can also be done between browser clients and proxies. One approach is to predict which cached documents a user might reference next (based on PPM) and take the advantage of idle time between user requests to push the documents to the users. The first two approaches run the risk of increasing wide area network traffic, while the last one only affects the traffic over the modems or the LANs. All of these approaches attempt to prefetch either documents that are considered as popular at servers or documents that are predicted to be accessed by user in the near future based on the access pattern. a) Client validation: This approach is also called polling-every-time. The proxy treats cached resources as potentially out-of-date on each access and sends an If-Modified-Since header with each access of the resources. This approach can lead to many 304 responses (HTTP response code for "Not Modified") by server if the resource does not actually change. b) Server invalidation: Upon detecting a resource change, the server sends invalidation messages to all clients that have recently accessed and potentially cached the resource. This approach requires a server to keep track of lists of clients to use for invalidating cached copies of changed resources and can become unwieldy for a server when the number of clients is large. In addition, the lists themselves can become out-of-date causing the server to send invalidation messages to clients who are no longer caching the resource. The GPS is a worldwide radio navigation system formed from a constellation of 24 satellites and their ground stations. GPS uses these “manmade stars” as reference points to calculate the positions accurate to a matter of meters. In fact, with advanced forms of GPS you can make measurements to better than a centimeter! In a sense it is like giving every square meter on the planet a unique address, the system was designed for and is operated by the U. S. military. GPS is funded by and controlled by the U. S. Department of Defense (DOD). While there are many thousands of civil users of GPS world wide. GPS has mainly 3 parts the space segment, the user segment and the control segment. They are collectively called as GPS Elements. 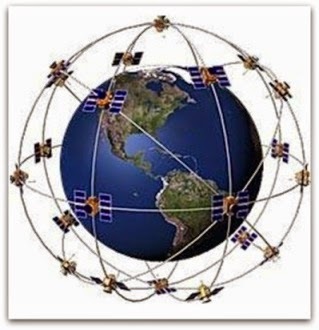 GPS has mainly three elements they are the space segment the user segment and the control segment .The space segment consists of the nominal GPS satellite network that consists of a constellation of 24 satellites that orbit the earth in 12 hrs. These space vehicles (SVs) send radio signals from space. The Control Segment consists of a system of tracking stations located around the world that make sure the satellites are working properly. The GPS User Segment consists of the GPS receivers and the user community. GPS receivers convert SV signals into position, velocity, and time estimates. Four satellites are required to compute the four dimensions of X, Y, Z (position) and Time. GPS receivers are used for navigation, positioning, time dissemination, and other research. Now we can discuss about these GPS elements in detail. Here we can discuss how the receiver and satellite work together to make this measurement .GPS receiver calculates the distance to GPS satellites by timing a signal’s journey from satellite to receiver, as it turns this is a fairly elaborate process. At a particular time, the satellite begins transmitting a long, digital pattern called a pseudo-random code. The receiver begins running the same digital pattern also exactly at that time. When the satellite’s signal reaches the receiver, its transmission lag a bit behind the receiver’s playing of the pattern. The length of the delay is the signal’s travel time. The receiver multiplies this time with the speed of the signal to determine how far the signal traveled. In order to make this measurement the receiver and satellite both need clocks that can be synchronized down to the nanoseconds. Thus every satellite is equipped with an expensive atomic clocks and the receiver itself uses an ordinary quartz clock, which it constantly resets. In order for the distance information to be of any use, the receiver also has to know where the satellites actually are. The GPS receiver simply stores an almanac data that tells it where every satellite should be at any given time. Things like pull of the moon and the sun do change their orbits very slightly the Department Of Defense constantly monitors their positions exactly and transmits any adjustments to all GPS receivers as part of the satellite’s signals. All of us know that motor is a machine which produces or imparts motion, or in detail it is an arrangement of coils and magnets that converts electric energy into mechanical energy and ultrasonic motors are the next generation motors. In 1980,the world’s first ultrasonic motor was invented which utilizes the piezoelectric effect in the ultrasonic frequency range to provide its motive force resulting in a motor with unusually good low speed, high torque and power to weight characteristics. Electromagnetism has always been the driving force behind electric motor technology. But these motors suffer from many drawbacks. The field of ultrasonic seems to be changing that driving force. When a voltage having a resonance frequency of more than 20 KHz is applied to the piezoelectric element of an elastic body(a stator),the piezoelectric element expands and expands and contracts. The piezoelectric ring is divided into two groups of alternated polarities, which are driven simultaneously by cyclic signals that are ninety degrees out of phase, to produce a traveling wave of flexural vibrations. The third input lead is ground and attached to the ring itself. It acts as a common return to both the out of phase input leads. A stator and a rotor (dynamic body) are coupled to form an ultrasonic motor. The dynamic body is pressed against the side of the stator metal surface which the piezoelectric ceramic is not glued on.Comb tooth grooves are created on this side. The rotor (dynamic body) is pressed tightly against this side of the stator metal surface so that they are adhered together closely. As the progressive wave travels and undulates through this contact surface, some areas of the surface of the rotor which is tightly adhered to the stator are contacted by the vertices of the wave and some areas are not. At this time, at the vertices of the progressive wave that contacts the rotor surface, an elliptic motion is generated. The locus of the elliptic motion points to the opposite direction of the progressive wave traveling on the stator surface. At the same time, it has a vertical elliptic motion in contrast to the horizontal undulation of the progressive wave that travels on the stator surface. 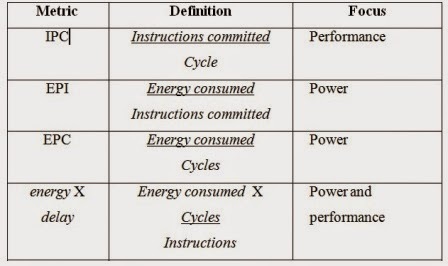 Reversing the polarity of the input power will reverse the direction of rotation. The rotor and stator are pressed against each other with strong pressure to create tight adhesion. The progressive wave travels along the circumference of the stator while undulating. Only the vertexes of the progressive wave contact the rotor surface and an elliptic rotary motion is generated at each vertex. Affected by the elliptic rotary motion, the rotor is impelled to rotate. As the direction of the locus of the elliptic motion is opposite to the direction of the progressive wave, the rotor affected by it also rotates in the opposite direction of the progressive wave. 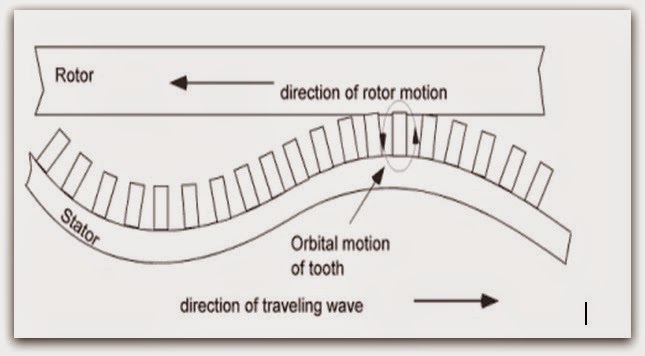 When the progressive wave travels along the circumference of the stator clockwise (CW), a counterclockwise (CCW) elliptic rotary motion is generated at the vertex of the wave contacting the rotor surface. The rotor contacting the vertex is impelled by the CCW elliptic rotary motion and rotates CCW. As the ultrasonic motor does not use coil or magnets as its driving force, it does not generate magnetism. It can be operated without influence of magnetism even in strong magnetic fields. As the USM does not require coils, it has a simple and lightweight structure. Further more, as it doesn’t require reduction gear due to its low speed, and uses ultrasonic vibrations in ranges not audible to the human ear, its running noise is extremely quiet. Only 2 ms are needed to start the motor from zero. 44. FADEC - Full Authority Digital Engine Control.